Cannibal Hunter Irving, of Chicken Kind, Eaten by Neighbor. The criminal(name withheld by request of the family) was apprehended when the police found the contents of his deep fryer contained chicken. Neighbor's lawyer claims it was "[my client's] own flesh, from an accident." Police claim the accusation is ridiculous, based on the percent content and lack of injuries to the accused. The Irving family is very distressed, and says "[the accused] was always such a nice man. He even helped with the day to day things." The funeral will be closed casket, as much of the body was disposed of by the heinous acts of the accused. It's been a while since I last took on a challenge so I figured I would do this one. 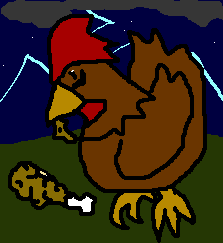 I feel kinda weird trying to make something look evil for eating a piece of fried chicken. I mean, I know I enjoy myself some chicken. Oh right... CHALLENGE COMPLETE!! I love the deranged look in his eye. Mad Chicken Disease, perhaps?